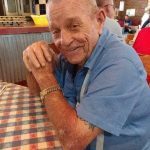 Johnie Heath, age 88, of Granbury, Texas, passed away on Wednesday November 28, 2018. Service: 2:00 P.M., Tuesday December 4, 2018, Martin’s Funeral Home Chapel, Granbury; Interment: Acton Cemetery; Visitation: 6:00 – 8:00 P.M. Monday December 3, 2018 Martin’s Funeral Home. Johnie was born on February 22, 1930 in Vernon, Texas to Ada (Hulme) and Clayton Heath. Johnie proudly served his country in the United States Army; a veteran of World War II; Germany. Johnie retired from Union Pacific Railroad; after over 40 years as a machinist. After retirement, Johnie was a very independent man. Johnie enjoyed working with tools and he loved carpentry, golfing, bowling. He was a Charter 32 degree member of Valley of Fort Worth Orient of Texas since 1968. He was preceded in death by his wife: Frances; parents: Ada and Clayton Heath; son: Robert Lynn Heath; sister Reba; brother: Herman Odell Spruill. He is survived by his daughters: Debra Farquhar and Dianna Cowan; grandchildren: Jennifer Marie Finley and husband Dustin, Tamra Lynn Cowan, Kaitlin Elaine Cowan, Ashley Heath Davis, Samantha Heath, Christopher Heath; eight great-grandchildren; and siblings: Joe Earl Heath (Connie), Jimmy Lee Heath (Sonya) and Ruby Alice Kendrick. So sorry for your loss, Dianna. I am so sorry to hear that Johnnie passed away. Y'all are in my prayers.